Roku is a well-known maker of streaming sticks and media players, but there's a growing selection of TVs with Roku already built-in; from brands such as TCL, Sharp, RCA, Philips, Hitachi, Hisense, Insignia, and Element. The remote control provided for Roku TVs is very similar to those provided with streaming sticks and streamers, but there are additional things your Roku TV remote can do. 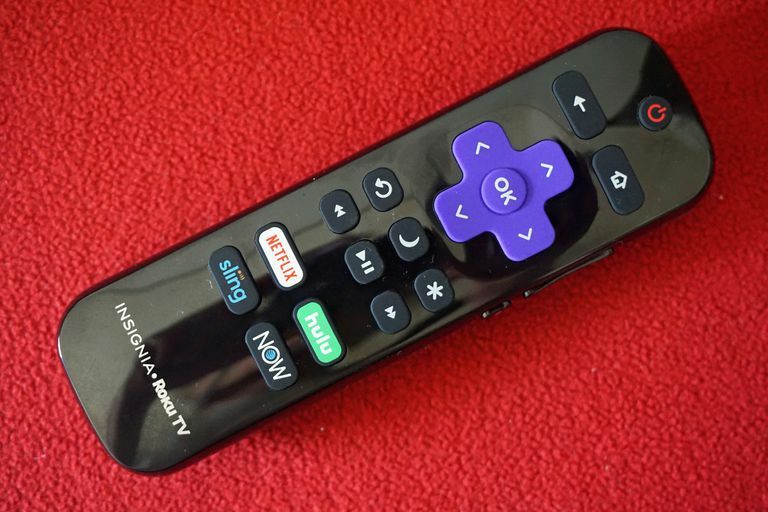 Let's take a look at what some of the buttons on a Roku TV remote are, and how to use them. Roku TV Remote Home Button and Screen. To find out what your Roku TV can do after you turn it on, you need a starting point. That starting point is the Home Screen. To get to the Home Screen on a Roku TV, just press the Home button, which has an icon that looks like a house. Once on the home screen, you'll see the main operational categories, as well as the list of inputs and streaming apps. If you press the home button while watching a TV or streaming program, it will be interrupted, however, you can't display the home screen at the same time you're watching TV or streaming content. Roku TV Remote Back Button. The Back button is a shortcut that will automatically return you to the previous step or screen. For example, if you're watching something via an app, the back button may return you to the previous content selection screen. If you're watching something on a TV channel or input, it will return you back to the home screen. In this case, the button can be redundant as the home button also takes you back to the home screen. Roku TV Remote Channel Jumpback, Sleep Time, and View More Options Buttons. Channel Recall/Jump Back: If you're watching TV programs via the antenna/cable (no box) connection, this will take you back to the previous channel. If you're viewing streaming content, you'll go back one position. If you're in search and are entering search terms, it will take you back one letter. Sleep Timer: This allows you to decide when the TV shuts off. Time intervals include 30 minutes, 1, 1.5, 2, and 3 hours. View More Options: This button takes you directly to a more detailed video and audio settings menu. Roku TV Remote More Options Button. When you press the More Options button, you access more detailed settings for both video and audio. Some of these are accessible separately from the main home menu categories, but options such as Picture Size, Audio Effect, and Advanced Picture Settings can only be accessed via More Options. Picture Size: This adjusts the Aspect Ratio. The selections are Auto, Normal (16x9), Direct (4x3 or 16x9 depending on content), Stretch, and Zoom. Audio Effect: Provides presets to optimize audio quality for different types of content, including Normal, Speech, Theater, Big Bass, High Treble, and Music. These settings only apply to the TV's speakers. Advanced Picture Settings: This menu allows you to adjust several picture parameters, separately for each input source, including streaming. In addition to familiar settings, such as LED backlight intensity, brightness, contrast, etc, you can also set the color temperature, which makes the picture warmer or cooler, as well as the Game Mode, which decreases input lag for a faster response but slightly impacts picture quality. The More Options button only works if you're viewing content. If you press it while viewing the home page, it doesn't work. Re-ordering Apps on Home Menu. Press the Home button on your Roku TV Remote. Press right ​on the directional pad to access the channel list. Use the directional keypad to highlight the channel you wish to move. Press the More Options button. Rename Inputs on Home Menu. Using the directional keypad on the Roku TV remote, you can label the TVs inputs so that they are easier to identify. This means that instead of HDMI 1, 2, 3, AV, and Antenna, you can using the onscreen menu system to associate the input names with the type of devices you have connected to the TV. Select the input you want to rename. Scroll through the available list of names and select the one you want to use by pressing OK on the TV remote's directional keypad. Repeat these steps for each input you want to rename. Roku TV Remote Playback Control Buttons. If you're playing pre-recorded streaming content, you can use these buttons control playback. For left to right, they're Reverse/Rewind, Play/Pause, and Fast Forward. These operate just like the playback controls on a VCR, DVD, Blu-ray, Ultra HD Blu-ray Player, DVR, or other media streamers. If you're watching something live, these buttons are non-operational. On some live webcam sites, you may be able to pause the video feed, but when you press play it will skip ahead to the live video. You're also unable to reverse or fast forward a live video or TV program. Roku TV Remote Channel Shortcut Buttons. Every Roku remote, including their TV remotes, feature shortcut buttons that take you to select internet streaming channels, including Netflix, Hulu, Sling TV, and DirecTV Now. This selection varies depending on the TV brand and model. Netflix is always featured, but other shortcuts may be included for Amazon Prime, Google Play, CBS All Access, VUDU, or other selections. Roku TV Remote Mute and Volume Control Buttons. Located on the right side of a Roku TV Remote Control are the Mute, Volume Down, and Volume Up buttons. Roku TV Remote Sleep Timer vs Microphone Button. If you have a Roku TV that comes with an Enhanced Remote, you might notice a Microphone button in place of the Sleep Timer button. "Switch the input to HDMI 1." "Change broadcast channels Channel Up/Down." "Tune to channel 6 dot 1 (6.1)." If your Roku TV doesn't come with an enhanced remote, it may be offered as an upgrade option. This offer varies with by TV brand. Roku TV Enhanced Remote Earphone Jack. On the left side of Roku Enhanced Remotes, you may have a mini-plug for connecting earphones, which are provided in the package with your Roku TV and remote. This allows you to listen to the content shown on your TV privately. The TV's speakers will automatically disable when you plug the earphones in. If your TV speakers don't disable when you plug in the earphones, you can disable and enable them through the Audio settings category in your home menu. The TV's speakers will become active again when you unplug the earphones. In addition to the remote that comes with your Roku TV, there are three additional ways you can control some or most of its functions. These options will work with any Roku TV. Roku Mobile App: This iOS and Android app enables you to use your smartphone to control your Roku. Alexa via Quick Remote App: Available for both iOS and Android, this app enables you to control some features of your Roku TV using Alexa. Google Home via Quick Remote App: This Android-only app enables you to control some features of your Roku TV using Google Home or Google Assistant.